Note: Please contact me if you would a copy of any of these papers not available on the web and I'll see if I can provide it. 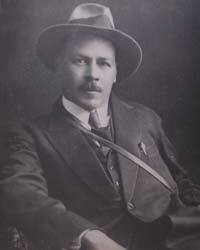 This picture of Nikoli Vavilov looks down at you as you enter the Ethiopian Gene Bank in Addis Ababa. He collected seeds from all over the globe as he developed his theory about the centres of origins of different plants. A special issue of the IDS Bulletin in July 2011 examined some of the contempory issues facing seeds provision in Africa - if and how small farmers can maintain and develop on-farm biodiversity in the face of an increasingly concentrated corporate seed sectors using legal - patents and plant variety protection - and technological means to control the seed business. Climate change looms large this century. So too does a redistribution of economic and political power. Both will put huge pressures on our capacity to cope with major changes in a peaceful way, and without serious conflicts or catastrophes. One element in being able to do so is to ensure local capacity to maintain, develop and adapt seeds to suit the changing environments - in situ. Another is to ensure the flexibility to share seeds - genetic resources - and knowledge about them between places. Gene banks - ex situ - are also a means of safeguarding the seeds from the many varieties of plants created through farmers' activities over the years and the wild relatives of cultivated plants.